Much later, today, ITC is a theater with 220 seats among the most active and popular theatres in Emilia-Romagna Region. 30,000 people audience per year in a city with 30,000 inhabitants. More than half of them are from Bologna. Many come from outside the province. Some of the most important artists of Italian theatre perform here, as well as musicians, writers, scholars, photographers... ITC is a kind of meeting place open to crossings and contamination, where you can meet people, connect in strong relationships, listen to stories. In every room of our home every day, there are people working and rehearsing, setting up scenes and welcoming audience and friends, just as you would in a normal house. With this only difference: in this house you turn work into passion and passion into time to devote to others. We imagined a world where theatre is as essential as air, where no one can live without the pleasure of being with others to invent words, actions, fragments of speech and shards of emotions you can share. We imagined such a world could not exist. On the contrary, as it often happens, reality goes further beyond imagination. There’s a place in San Lazzaro, where adults and children, Italians and foreigners, amateurs and professionals meet and work together every day, all year long, thinking about theatre, playing theatre, building theatre together. This place is called ITC Studio and is the venue where workshops take place. Here, every day, all year round, seven cosy rooms house TdA teachers and students, engaged in fulfilling their theatrical apprenticeship with passion and lightness. They know what a commitment is necessary to deal with such a compelling though enjoyable and rewarding game. But not only. ITC Studio is a venue of theater research for the actors of the Company, where rehearse and create shows, a place of culture. It houses a theater hall with 99 seats where shows and performances take place. It is a space to fill and reinvent. 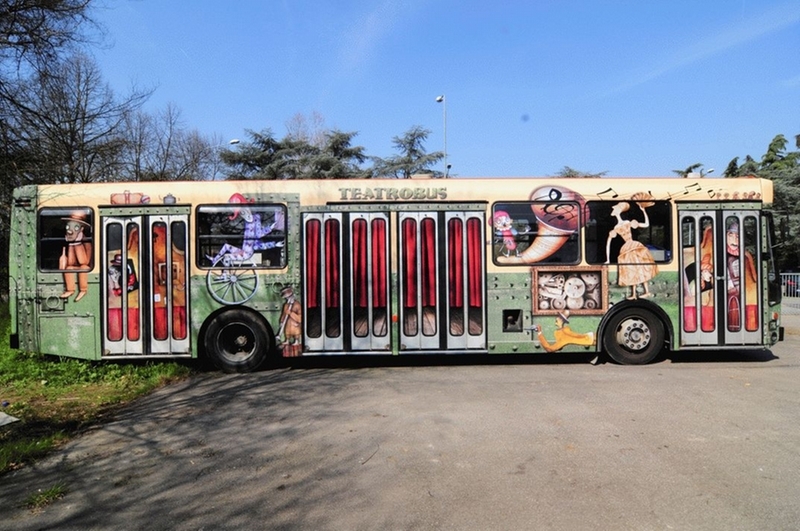 Teatrobus is a venue combining artistic, social, educational and cultural goals, as is the tradition of Company Teatro dell’Argine. Artistic value of shows, quality of the vision, penetration in areas not easily touched by theatrical or cultural initiatives, easy access to spectacular events even for non-playgoers: these are some of the project main aims. It is generally located in the courtyard of ITC Teatro, with a standard setting that includes about 35 seats, sound and low-consumption lights system, heating and air conditioning, 50-inch plasma TV and free wi-fi. Teatrobus can easily turn into a theatre venue for shows with frontal or central plan for adults and children, exhibition hall for photos, paintings or small sculptures exhibitions; a concert hall, a playroom with toys and activities for children; an outdoor cinema, endowed with screen 355x205cm, a library, a literary salon for readings, meetings, books presentations and a classroom for theatre and music workshops.